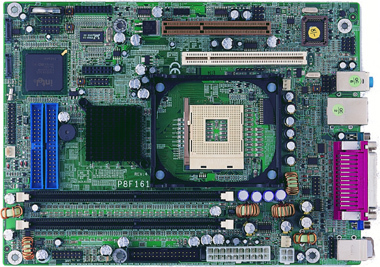 The P8F161/P8F167 is based on the Intel 865G chipset is designed to support the Intel Pentium 4 Processor with Hyper-Threading (HT) Technology, adding intelligence to help manage and prioritize multiple threads received from the microprocessor. This highl Technology, AGP8X Graphics, Intel Communication Streaming Architecture featuring a Dedicated Network Bus (DNB) interface for wire-speed Ethernet (GbE) and Hi-Speed USB 2.0 connectivity to ensure the flexibility and performance you expect. New power design supports Intel Prescott CPU! !